Voluntary Provident Fund is one of the best retirement investment option where a salaried employee can voluntarily contribute more than the upper ceiling of 12% towards his/her PF Account which can go up to a maximum of 100% of the salary. It is an extension of the Employee’s Provident Fund as part of Benefits. Though not mandatory for the employees, it has many benefits, viz.., risk free, tax benefit (under section 80C), proceeds on maturity being tax free, transferable, loan option, easy process to enroll and above all same interest rate as the Employee Provident Fund (EPF). This VPF enrollment was proposed to be introduced to one of the SOAIS customers as part of employee benefits program. This customer has around 20,000 employees. 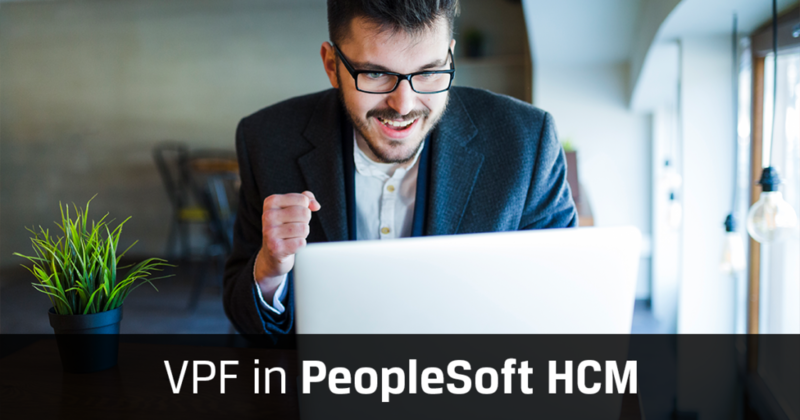 Firstly, the customer detailed out the expectations to ensure a user-friendly VPF page easily accessed by all the employees in PeopleSoft HCM. Keeping in mind the customer’s expectation, a simple interactive page was created. This was effectively introduced for the employees to fill in their VPF details in terms of percentage declaration. The opt-in window was kept open for the employees during a specific period of every month until they complete their first enrollment during the financial year. The VPF user interface page however, also gave an option to those employees from India who returned from on-site assignments in a different country. These employees can enroll for this scheme after their new PF number is allotted. The same process was enforced for the new joiners and for the employees who have been transferred between different companies. Once the cut-off date for a month was over, a report was designed to be sent to the payroll team for further processing of the request. Soon after the launch of VPF benefit to all India employees, the customer saw around 1000+ employees smoothly opting in for it within 5 days of go-live. The response to the new change was well received as the queries to the helpdesk regarding the enrollment were very few as the page was self-explanatory and user-friendly. Overall, the entire VPF process was designed as per the customer’s expectations which has been running smooth ever since it has been implemented. Does your organization have similar requirements? For flawless implementation of employee benefits, contact us, and we are here to help you.